Superior Remounts from Ten-8 & Foundation Ambulance, Inc.
Ten-8 Fire Equipment has partnered with Foundation Ambulance, Inc. to offer ambulance remount services. With ample expertise in the remount business, Foundation is a group of highly skilled craftsmen and women who have taken their decades of experience in the ambulance industry and joined together to form a company unlike any other. When finished, you will feel like you’re driving around in a new ambulance. Today, many ambulance modules outlive their chassis. Most modular bodies come with a 15 year to lifetime warranty; a chassis warranty is substantially less. Rather than abandon your existing box for an entirely new ambulance, you can save a significant amount of money and protect your original investment by remounting your emergency vehicle. In fact, you can save 25-45% compared to the cost of a new unit! Remount Your Ambulance Through Ten-8 & Foundation Ambulance, Inc.
Foundation Ambulance has spared no expense in setting up a remount facility on the cutting edge. They have a state-of-the-art paint booth and mixing room, supplied by PPG, where their master painters apply a professional finish. 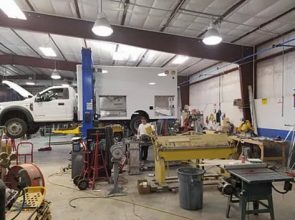 During the whole process, they are staffed by highly trained and knowledgeable workers, with every part of your ambulance remount done in-house. Our number one priority is that your unit is safe and secure before it drives back into service. Interested in an ambulance remount or have questions about it? Contact us via our online form or by calling 877-989-7660! A dismount and thorough inspection is completed, with metal repairs done, if required. Factory trained electrical technicians with decades of experience will review your electrical system and can provided upgrades or improvements if needed. Using Safety Saw technology, master craftsmen can install custom cabinetry into your newly remounted ambulance. Upholstery is not an issue for Foundation Ambulance; they can repair or replace whatever you have with custom crafted seamless upholstery, including a color change. And yes, child safety seats can be recovered! If you are in need of graphics, provide your own design or Foundation Ambulance can help come up with one. With a state-of-the-art printer & plotter, your graphics will be done in-house. We can remount your ambulance on a Ford, Chevy, Dodge, Kenworth, International, or Freightliner chassis. The remount process finishes 60 days after receipt of the chassis. You have the option to convert a Type I unit to a Type III, and vice versa. In addition, we can tackle ambulance refurbishment, painting, and electrical work at the same time. We have chosen to partner with Foundation Ambulance, Inc. because they offer the best ambulance remount services in the industry. Their dedication to customer satisfaction and and service after the sale coincides with Ten-8’s mission and values. If you are interested in learning more about an ambulance remount call us today at 877-989-7660 or fill out our online form to request a quote.